Many have asked us why our truffle Cubze are cubed and individually wrapped. Others have asked why we include little messages about happiness in each truffle. Here’s why: when starting the company back in 2011, our goal was to introduce a truly unique chocolate truffle as a means of spreading chocolate happiness. First we chose the cubed shape. Generally speaking, most chocolate truffles were and are spherical (or, “spherical-ish”). We thought the cubed shape was … Continue reading Why a Cubed Truffle? Customers and retail partners have told us that each of our truffle Cubze is like a “gift within a gift…” because of the little witty thoughts about happiness wrapped into each piece. After hearing these thoughts (time and again), we were inspired to create our holiday gift collection this year. The windowed chocolate gift collections highlight the shimmering foiled truffle Cubze inside each gold box and come with festive seasonal bows. To be accurate, should … Continue reading Gifts within Gifts! So why IS chocolate part of the Easter tradition? Every spring chocolate bunnies and chocolate eggs arrive in shops announcing the coming of Easter. But why? In pre-Christian pagan times, spring was celebrated by giving thanks to the ancient goddess of fertility Eostre—from which “Easter” derived its name. Since the rabbit was recognized as a symbol of fertility and new life, it became associated with the rituals of Easter and spring. According to the National Confectioner’s Association, Whitman’s Chocolates was one of the first … Continue reading So why IS chocolate part of the Easter tradition? One might assume that, as chocolatiers, we would instantly propose our fine chocolates. 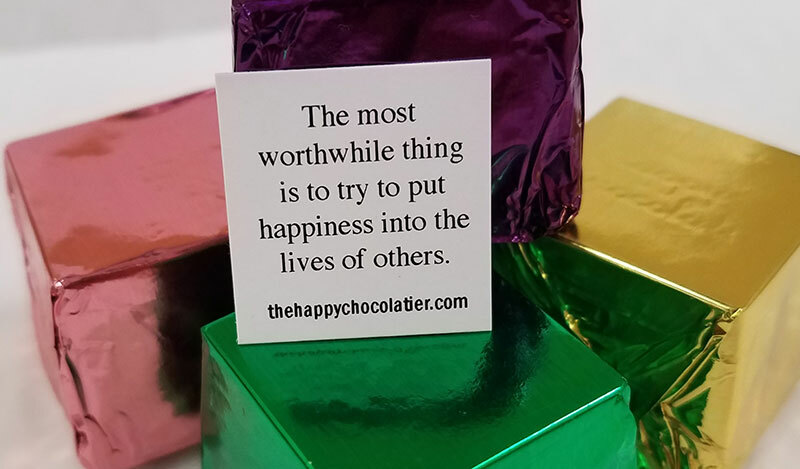 While we think great chocolate – especially dark chocolate – is a close second for many reasons, the best gift may be to “give happiness.” This Valentine’s Day consider giving your sweetie the simple gift of happiness. To do this, you must be happy. And to be happy, you must be joyful, appreciative and positive. Be thankful for your sweetheart, family and … Continue reading What’s the Best Gift for Valentine’s Day? It’s Not Just Chocolate…. Businesses have reasons throughout the year to express thanks to business associates. Yet, generally businesses only send or give gifts at the end of the year. Why? This seems like a disconnect. There are many reasons to give chocolates at various times during the year. Here are some ideas from our customers: A professional services firm sends a box of chocolates along with a thank you note to clients who have recently completed a project. … Continue reading Why Do Businesses Only Give Gifts at Year-End? Why Not Host a Chocolate Buffet at the Office in the Early Spring? Everyone loves a great ice cream buffet in the summer. So in the winter and early spring when everyone’s cooped up inside and wishing for summer, why not surprise employees with a chocolate buffet? Choose some chocolates, spread them out in a common area and let employees enjoy. Or, surprise employees by placing small chocolate selections on each employee’s desk. These are both great low cost ways of spreading some cheer at the office or … Continue reading Why Not Host a Chocolate Buffet at the Office in the Early Spring? Why Think About Corporate Gifts Now? Avoid Pain Later! In New England, the leaves are just starting to fall. But if you are giving corporate business gifts this holiday season to clients, customers or employees, now is the time to start planning. Beginning the process early results in less pain and stress when December rolls around. Now is the time to develop a budget, compile lists and research a proven partner to handle the development and delivery of gifts comes December (or even late … Continue reading Why Think About Corporate Gifts Now? Avoid Pain Later! You rack your brain trying to figure out what to get your mom for Mother’s Day– you do this in between running errands, picking up the kids, making dinner, running to a school event meeting, dropping off other kids, and doing the work at night that you didn’t finish at work. Now it’s Friday, May 8th and you’re still stuck…what to do? As a busy mom myself, I’ve been thinking about this. What would I … Continue reading Mother’s Day: Chocolate? Flowers? What do moms really want? When we think about Easter, we think bunnies, kids and, of course, chocolate. Each year at The Happy Chocolatier we try to do something fun for the kids prior to Easter. This year, in keeping with our mission to support our local community, we have decided to host a kids event that will support Household Goods (formerly HGRM), a fantastic organization located here in Acton. The event will take place on Saturday, March 21 from … Continue reading Giving back…and having fun doing it! Every Valentine’s Day, chocolate becomes part of the romantic holiday. Why? Is it because of all the health benefits of chocolate? Is it because it is simply satisfying? Or, is it just the tradition of it all? I think the tradition angle wins out. Chocolate has been referred to as “the food of the gods” since the time of the Aztec Indians. In fact the Aztec ruler, Montezuma believed chocolate was an aphrodisiac. Christopher Columbus … Continue reading Why Chocolate for Valentine’s Day? Ever had that tasteless watery brown stuff some folks pass off as hot chocolate. Technically speaking it is “hot” and does contain “some chocolate.” But, it certainly isn’t rich, creamy and really chocolatey. So, when customers at our store in Acton asked us for a hot chocolate, I began thinking through formulations. First, I decided on what I didn’t want: anything that one could just mix into water or some dry cocoa sugar mix … Continue reading The Best Hot Chocolate Ever….Comes From Cubze! Every Valentine’s Day, chocolate becomes part of the romantic holiday. Why? Is it because of all the health benefits of chocolate? Is it because it is simply satisfying? Or, is it just the tradition of it all…. I think the tradition angle wins out. Chocolate has been referred to as “the food of the gods” since the time of the Aztec Indians. In fact the Aztec ruler, Montezuma believed chocolate was an aphrodisiac. Christopher Columbus … Continue reading So Why Do We Give Chocolate for Valentine’s Day? This October marked the one year anniversary of the public launch of The Happy Chocolatier. It seems just a short time ago that we were developing our signature Cubze and writing the business case for The Happy Chocolatier. Now, a year later, we have a lot under our belt – not simply the extra few pounds, but the valuable learning from our mistakes and successes. This first year has been a great learning experience. As … Continue reading One Year In The Chocolate Business – Are We Still Happy? Well, after a summer hiatus I’m back at it. I recently came across an interesting piece entitled, “Candy Love,” published in The Manufacturing Confectioner. What caught my eye was one of the comments on candy and happiness. The article points out that countries with the highest per capita candy consumption rank the highest on the Global Happiness Index. While industry trade people are generally making the case for the benefits of their products, I thought … Continue reading Is Candy Getting a Bad Rap? Despite all the extra noise and confusion of having our kids home and out of school each day, we should take pause and consider all the happiness our children bring to us. Summer vacations and family outings are excellent times to take notice and enjoy our kids. While doing this, we can consider all the ways that our kids are happy and hope some of it rubs off on us as parents. There was recently … Continue reading It’s Summer. Enjoy the Kids and Savor the Happiness They Bring. As we approach Mother’s Day, I muse about the happiness moms bring to us throughout our lives. But I am also curious as to what makes moms happy about being mothers. Some of my thoughts on how moms make us happy: Kisses and bedtime stories Band-Aids and TLC for banged up body parts Cupcakes, brownies and other special homemade treats made for birthdays or “just because” Encouragement after losing the “big game” or not getting … Continue reading Moms, What Makes You Happy? As we finalize our preparations for Easter at The Happy Chocolatier – creating many different types of Easter baskets, dipping chocolate Easter treats, bagging jelly beans and stocking the shelves with a variety of chocolate bunnies – I thought it would be fun to share some of my favorite Easter candy factoids: – About 90 million chocolate Easter bunnies are produced every year – Milk chocolate Easter bunnies are clearly the preference over dark…65% and … Continue reading Fun Facts About Easter Treats! When I was a kid, I didn’t know anyone with nut allergies. As an adult I hadn’t thought too much about it other than occasionally hearing that a friend’s child had an issue with nuts. Since I have opened The Happy Chocolatier I must admit that I am amazed by the number of customers who have come in looking for nut-free chocolates and candies. My own son was recently diagnosed with tree nut allergies – … Continue reading The Need for Nut-Free: What’s Going On? As I started to plan for Easter for The Happy Chocolatier, my wife and I had an interesting conversation. Do most people buy a pre-made basket or do they have a special basket that is re-used every Easter and simply filled with new chocolate and candy treats? I grew up in a household where a new basket showed up each year. My wife, on the other hand, had the same basket that was used throughout … Continue reading An ongoing debate: Buy an Easter basket or buy the contents and re-use the same basket every year? I just read an article from Inc. titled, “Happiness Makes Your Brain Work Better” by Jessica Stillman. The premise of the article is that happiness drives success. As an entrepreneur who recently launched a chocolate business, I would have to agree with the article premise. I have been told that successful entrepreneurs have “an irrational exuberance” about what they do. I know I do – heck, I opened a business in a down economy. And, … Continue reading Happiness = Success? Yes! Did You Know? February 11, 2012 is World Happy Day! Okay, so this is a bit of a made up holiday like Sweetest Day. And, yes if you Google “happy day” you’ll find quite a few version. However, World Happy Day is linked to a really interesting movie, Happy. Simply, it is a movie about happiness. More specifically, it is a feature length documentary that takes viewers on a trek across five continents in search of the keys to happiness. Through interviews and telling the … Continue reading Did You Know? February 11, 2012 is World Happy Day! The Happy Chocolatier and SuzySaid.com/Acton recently conducted a survey of women and found that: – nearly 75 percent want to have flowers or chocolates delivered at home rather than at work – more than 80 percent will share chocolates with loved ones (i.e. you and the kids) as opposed to hoarding the treats for themselves So send those chocolates and flowers home and then you can enjoy them, too! One of our customers, a dear friend, shared these photos with us at The Happy Chocolatier. She brought a whole new meaning to recycling by using the colorful foil from our Fudge Cubze for some truly wonderful origami. It was especially satisfying to see what would normally be thrown into the trash transformed into artwork that has spread some happiness. What would you do with the foil or happiness statements from Fudge Cubze to … Continue reading Fudge Cubze Art – Bringing a Whole New Meaning to Recycled Art! New Englanders have had a love affair with ice cream since colonial days. Ice cream was introduced to the United States by Quaker colonists who brought their ice cream recipes with them. Confectioners sold ice cream at their shops in New York and other cities during the colonial era. Ben Franklin, George Washington, and Thomas Jefferson were known to have regularly eaten and served ice cream. My family eats ice cream year round. Supermarkets sell … Continue reading New Englanders Eat More Ice Cream than Any Other Region in the Country! I came across a blog that noted November was the most depressing month of the year for many reasons including: – It is getting colder – The green is gone from the trees – The grass is brown – Daylight is diminished I prefer to think of Thanksgiving when I think about November. Both the capital “T” Thanksgiving, as in the wonderful holiday with friends and family, and the time of year when many volunteer … Continue reading November – Depressing? Not really. At our store Grand Opening in Acton, MA, we invited customers to share happiness statements with us. We hope to use some of them in our Fudge Cubze and offered to give the winner a large box of them. I assumed that those providing thoughts on happiness would be mostly adults. Was I ever wrong; the most profound of the statements were from kids and teens, such as: – Happiness is not a reward, it’s … Continue reading Happiness statements from kids and teens – truly inspirational! Several folks have asked me, “Why cover the fudge in chocolate?” and “Why hand foil each piece?” Well, being a big fan of chocolate and having sampled many types over the years, I decided that something was missing with traditional fudge. I enjoyed fudge, but never did like the presentation or the fact that many were really sugary and overly sweet. I wanted to take fudge up a notch and decided that two critical areas … Continue reading Why Fudge Covered in Chocolate?